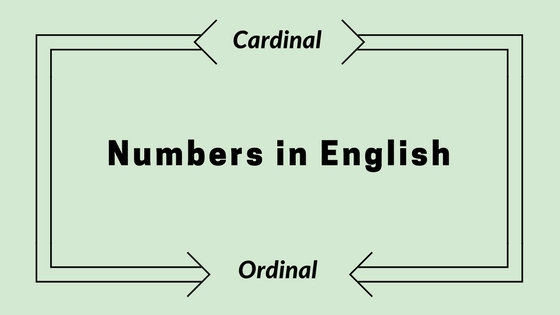 For most people when they learn the numbers in English, they start by learning the cardinal numbers. However, you can’t communicate effectively in English when you only know the cardinal numbers. 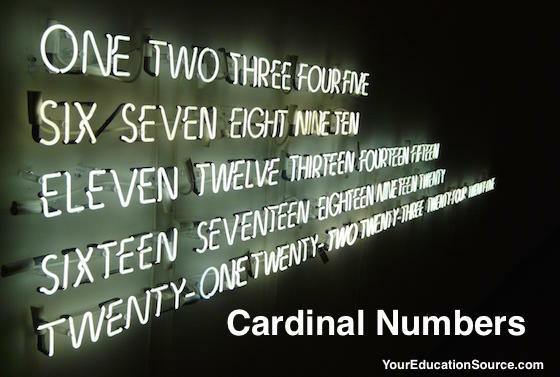 Let’s take a look at what the cardinal numbers and ordinal numbers are used for. The cardinal numbers are used to tell the quantity of something. They are used to count things. In fact, the best way to learn the cardinal numbers is by counting things you see every day. For example, if you drive to work, count how many cars you pass, or how many cars pass you! Another way to practice your cardinal numbers is to say the numbers on the license plates of other cars. Say the numbers out loud to practice your pronunciation. There are many things throughout your day that you can count with the cardinal numbers. Here is a list of the cardinal numbers one through ten. The ordinal numbers are used for naming things in a list. The most popular use is for saying the date. When you say the date in English you use ordinal numbers. (And remember that in the United States, we write the month first, then the day.) The ordinal numbers for many people are harder to pronounce then the ordinal numbers, but they are common, so it’s definitely important to learn them. Another popular use for ordinal numbers is the names of numbered streets. For example, a famous street in New York is Fifth Avenue. 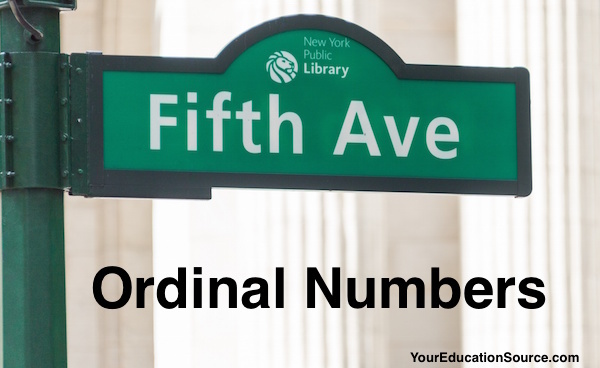 Many cities have numbered streets, and you need to use the ordinal numbers when you talk about them. Take a look at the examples. 1) There is a new restaurant that opened on Third Street. 2) You need to turn right on Second Street. Here is a list of the ordinal numbers one through ten. Perhaps the most difficult part of the ordinal numbers is the pronunciation of the [th] at the end of the words. The sound /th/ gives a lot of people problems. It takes some practice to pronounce the [th], but you can do it! The key is the tongue needs to go slightly between the teeth when making the /th/ sound. I’ve made a video for this post, so you can listen to the way the words are pronounced. Check it out! ¿Los Números ordinales y cardinales? Para la mayoría de la gente cuando aprenden los números en inglés, comienzan del aprendizaje con los números cardinales. Sin embargo, no puedes comunicarte eficazmente en inglés cuando sólo te sabes los números cardinales. Echemos un vistazo a lo que los números cardinales y números ordinales para que se utilizen. Los números cardinales se usan para decir la cantidad de algo. Se utilizan para contar las cosas. De hecho, la mejor manera de aprender los números cardinales es contar cosas que ves todos los días. Por ejemplo, si manejas al trabajo, cuenta cuántos coches que pasas, o ¡cuántos coches te pasan! Otra manera de practicar sus números cardinales es decir los números en las placas de los otros coches. Di los números en voz alta para practicar tu pronunciación. Hay muchas cosas a lo largo de tu día que puedes contar con los números cardinales. Aquí hay una lista de los números cardinales de uno a diez. Los números ordinales se utilizan para nombrar cosas en una lista. El uso más popular es para decir la fecha. Cuando dices la fecha en inglés usas números ordinales. (Y recuerda que en los Estados Unidos, escribimos el mes primero y luego el día.) Los números ordinales de muchas personas son más difíciles de pronunciar que los números ordinales, pero son comunes, por lo que es definitivamente importante aprenderlos. Otro uso popular para los números ordinales son los nombres de las calles numeradas. Por ejemplo, una famosa calle de Nueva York es la Quinta Avenida (Fifth Avenune). Muchas ciudades tienen calles numeradas, y necesitas usar los números ordinales cuando hablas de ellos. Echa un vistazo a los ejemplos. 1) Hay un nuevo restaurante que abrió en Third Street. – There is a new restaurant that opened on Third Street. 2) Tienes que girar a la derecha en Second Street. – You need to turn right on Second Street. Aquí hay una lista de los números ordinales de uno a diez. Quizás la parte más difícil de los números ordinales es la pronunciación del [th] al final de las palabras. El sonido /th/ da muchos problemas de la gente. Te necesita cierta práctica para pronunciar el [th], ¡pero puedes hacerlo! La clave es que la lengua necesita ir ligeramente entre los dientes al hacer el /th/ sonido. He hecho un video para este post, para que puedas escuchar la forma en que se pronuncian las palabras. Está arriba, por favor ¡míralo!